About 15 pounds of Indian Corn was drying on the cob in he greenhouse. Today I removed the kernels with my small hand sheller. Shelling corn without a tool is a tedious job. The kernels will be further dried for Winter storage. I use them as addition to gruel for breakfast. At first it is necessary to nixtamalize to get the maximum nutrients. The corn must be very dry for storage otherwise mold will grow. 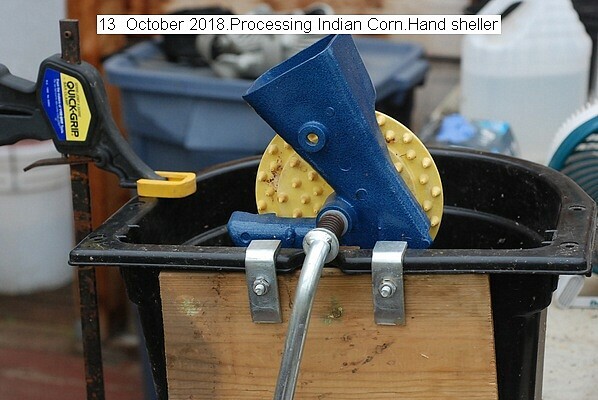 This entry was posted in Uncategorized and tagged 13 October 2018 Indian Corn, Hand Shelling Dried Corn, Sheloing Indian Corn. Bookmark the permalink.